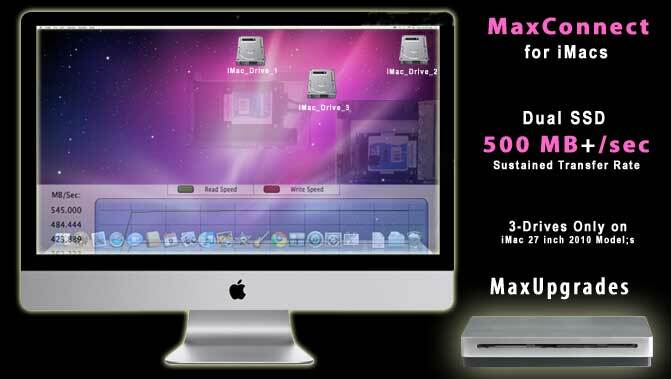 iMacs 2010-2011--- 27 inch Models , offers three SATA Channels, three SSDs can be installed in the 27 inch iMac 2010 / iMac 2011 Models ,one SSD in the main drive bay and one in the SSD Bay and one in the Opitcal Bay via MaxConnect MaxCoonet kits [Dual SSDs for Performance], along with the 3.5 inch Hard Disk Drive for the DATA Storage in the Hard Drive Bay/System Drive Bay [3.5 Form Factor]. MaxConnect features many important design parameter, machined from single piece of Solid Aluminum, it is Optimized for the maximum Heat Dissipation and helps to maintain Structural Integrity of the Chassis. 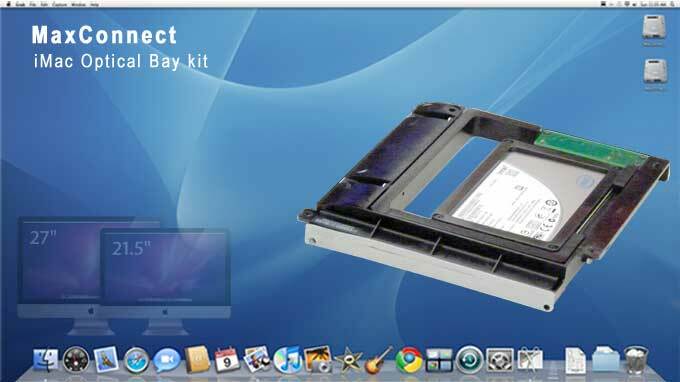 Shown above is test of the Dual Intel SSD's [Intel X-25m G2] configured as striped RAID 0 Volume. Dual SSD Drives Test: OCZ Vertex 2 [Sandforce SF-1222 Controller] delivering unprecedented performance in RAID 0 configuration and pushing limits in both sequential and random read/write rates on a 3Gb/sec internal SATA Port , these Transfer rates was achieved earlier on 4 SAS 15k-Drives Striped RAID 0 configuration on a Mac Pro, [each Vertex 2 --- performance in 4k file writes up to 50,000 IOPS ], MacBook Pro 2010 Core i7 shown on the image. SandForce SF-1222 Controller based SSD drives are available in 400GB/200GB / 100GB /50GB Capacities with 28% over-provisioning, and 60GB/120/240GB/480GB are available in with 7% over-provisioning.